Why You Should Manufacture In China! With all the speculation in the American media regarding Donald Trump’s desire to bring manufacturing back ‘in-house’ to the U.S.A., we will take a look as to why China is still such a fantastic place to manufacture and why this should matter to you. Generally, when you think of manufacturing, you think of China. I know, it is a bit of a cliché, but manufacturing, especially in the West, has been declining for many years and one of the reasons for this is generally blamed on ‘cheap’ production in China. Well, as with most things, this is only partly true! One of the main reasons that manufacturing has been declining, according to the engineers still left working in the West, is that not a lot of people want to study engineering at university anymore. This is admittedly, starting to change and, even better for the industry, more women are also finding that engineering is the career for them, but this will not change overnight. This has not been the case in China, where many students are proud to be engineers and like nothing better than getting their hands dirty in a tooling workshop or producing top-end electronics for the likes of Huawei and Xiao MI. So, why should you manufacture in China? 1.) Availability of Skilled Workforce: It’s all very well and good being cheap, but you need a highly-skilled workforce in order to make the stuff for you. High quality and reliable staff are an investment for a business and, unfortunately, the cost is pretty much the same throughout the world. This is so as to attract the best and the brightest from wherever they are to come and work, which benefits everyone. China is lucky in that its indigenous workforce is highly educated and trained and this has enabled companies to employ local staff who know their stuff and live around the corner. This reduces costs, which can be passed onto the customer. Result! 2.) Access to Raw Materials: China is big and has a lot of natural resources that are required in manufacturing. This ready availability is essential in order to reduce costs and time during production, as well as ensuring quality through the supply chain. A lot of this is luck, however, and where there are deficiencies in resources, China has been able to go out and look for what they need to manufacture, therefore boosting economies around the world and employing locals to provide for the Chinese manufacturing sector. 3.) Location! Location! Location! : China has a very useful location in the world, with the Pacific Ocean being ideal to transport large quantities of goods straight to North America, Europe and Australasia. Not only that, but the first freight train running from China to the U.K. has completed its maiden voyage, further enhancing China’s ability to ship the goods it produces. It is also not as subject to so many natural disasters as many Asian countries and this helps to allow continuity of production and reduce costs associated with downtime. 4.) Access to First Rate Technology: China has a large and successful IT infrastructure and this technology enables them to both reduce costs and streamline production, which was initially created by the Japanese in the 1980s. 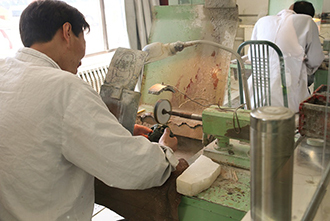 ‘Just-In-Time’ and other production methods have enabled companies to reduce their stockholding, which frees up capital to invest into the business and reduces costs, as opposed to traditional manufacturing techniques. 5.) The Ability to Adapt: This is probably one of the most important reasons why manufacturing in China is so important. Being unable to adapt to changing trends is one of the major downfalls of any company, industry or country and China has been able to move on from pure manufacturing to now being one of the most innovative countries out there. Gone are the days of copying what everyone else has done previously, China is able to lead the way in many industries and this is only set to continue. Adaptation is the name of the game and China is in it for the long haul!